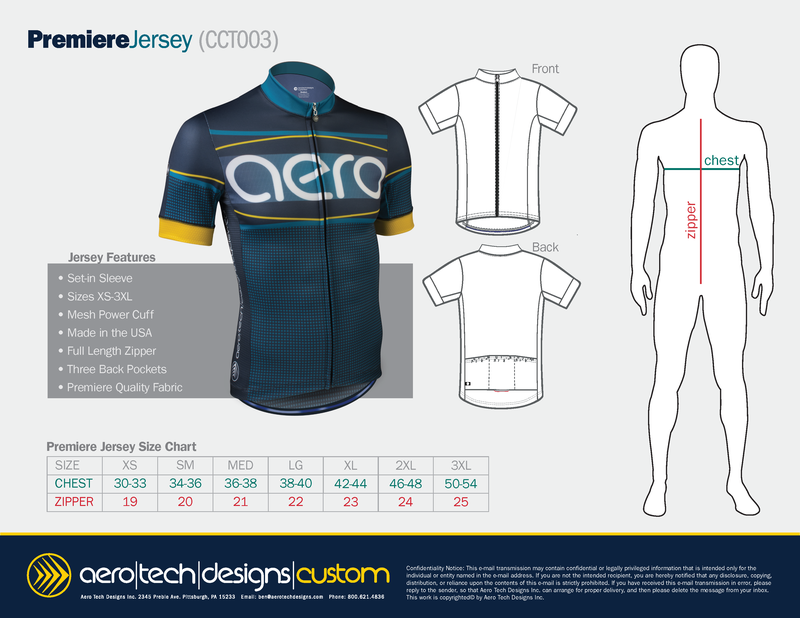 After many rounds of research and development, Aero Tech Designs has developed the perfect jersey for training, racing, and style on your bike. The perfect blend of aerodynamic tailoring and top of the line fabric make this jersey fit to be called elite. Designed for the cycling position, the set-in sleeves of the Premiere Jersey create a beautiful fit from the neck and shoulder to the bicep. This gives the Premiere Jersey an aerodynamic advantage by fitting tight against the rider's body allowing air to flow freely over the body and eliminate air pockets in the fabric. Crafted from Cooling Fabric Technology - AeroCool™ Fabric Content: 50% Cataonic Polyester - 50% WickAway Polyester on the body, the side panels, arm pits and sleeve cuffs are a highly stretchable micro mesh. The Premiere Jersey has the perfect amount of stretch, giving the rider a tailored race fit but still allowing for comfortable movement both on and off the bike. To help manage moisture and keep body temperatures down, the Premiere Jersey is designed with silky micro-mesh side panels. These panels start at the underarm and continue to the bottom of the jersey. The Aero Tech Designs Power-Cuff is crafted from the same mesh side panel material. The Power-Cuff allows muscles to flex during effort but does not bind or restrict muscle movement. Additional features include a full zipper for easy on and off with an Aero Tech Designs pull tab and a reflective element below the rear pocket. Available in sizes X-Small to 3XL and crafted with pride in the USA. Aero Tech Designs can create amazing designs for your team! Reflective tab on the middle pocket is made by 3M reflective. 3M reflective is known worldwide as best in class and will aid in enhanced visibility. Aero Tech Designs manufactures this Cycling Peloton Jersey with full length, separating YKK zipper front and raglan sleeves, designed to work for the competitive team or the weekend club ride, the peloton jersey is crafted from soft and rugged AeroCool™ Fabric, a soft "Cooling Fabric Technology" that perfect for the wicking sweat away and keeping cool on hot days. Cooling Fabric Technology - AeroCool™ Fabric Content: 50% Cataonic Polyester - 50% WickAway Polyester. Features include an cooling technology with fully integrated moisture management, with an anti-microbial feature. The fabric is a knitted, honey comb one side, with a melange polyester blend on the other side that contains a Max-Dri construction and MicroBlock for sun protection. This fabric will cool better than regular polyesters, and will last longer. Garment has the added benefit of a inherent protection from the sun's harmful ultraviolet rays (UPF). AeroCool™ fabric is a scientifically engineered athletic performance fabric. The fibers are technically designed to deliver an advanced cooling effect. The fibers help with regulating body temperature. The fibers are a melange of quick dry, microfiber filaments constructed together to harness the cooling effect of our body’s natural cooling perspiration. The material will optimize comfort by lowering the skin’s surface temperature. Sunrays are reflected off the body enhancing a cooling effect while offering a high rate of UV protection. AeroCool™ is not like other technical fabrics that use a natural sweetener found in gum to produce a cooling effect on the skin. This product uses an embedded fiber melange which is a multi-layered, three dimensional honeycomb knitting process that is engineered to ensure the cooling effect remains permanent for the life of the garment. It's cooling effect is within the nature of the combination of extruded polyester fibers that have built in shapes that manage your body's moisture to enhance its cooling effect. That means the entire jersey is working to evaporate sweat and cool the skin. AeroCool™ will wick and circulate moisture to regulate evaporation. AeroCool™ fabric will reduce temperature at the surface of the skin to transport moisture across the surfaces of the garment to and will prevent wet, dark sweat areas. AeroCool™ fabrics are technically engineered to deliver advanced cooling effect. The push pull construction creates a breathable surface for moisture management and temperature control. The fibers are a scientifically engineered melange of quick dry, microfiber filaments constructed together to harness the cooling effect of our body’s natural cooling perspiration. 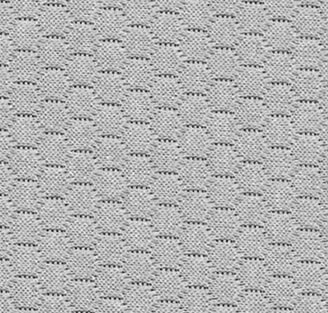 This is an AeroTech™ Custom knitted fabric. Check out our Race Ready Premiere Garments! Get Full Custom Design Services from our in-house design team. Look great with your club in our Premiere Cut!